Early in the morning we will transfer you from your hotel to airport in Istanbul for your flight to Cappadocia. 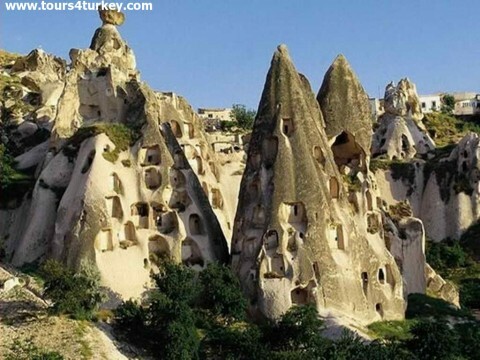 You will arrive in Cappadocia after a 55-minute domestic flight. On arrival in Kayseri airport we will meet you and drive to cave hotel for check in. At 09:30 we will pick you up for the day tour of Cappadocia. You will visit: Derinkuyu Underground City, Belisirma Greek Village,Selima Monastery, Pigeon Valley, Uchisar Castle and Ihlara Valley. Today you will have a delicious Cappadocian Lunch in a good local restaurant. The tour will finish at around 17:00 and then you will transferred back to your hotel for overnight. Balloon Flight at Sunrise Time: Today at 04:15 am we will pick you up from your hotel for an hour of balloon flight above Cappadocia. Cappadocia with its fairy chimneys, valleys and mysterious-looking caves is one of the most popular destinations for hot air balloon flights. Please take your camera and sunglasses. The balloon flight will end at 07:45-08:00 am and we will bring you back to your hotel for breakfast and for refreshment. At 09:30 we will meet you at hotel and start the second tour for discovery of the beautiful Cappadocian Cave Churhces, Devrent Valley, Pasabagi vineyard valley, Cappadocia Fair Chimneys and Goreme Open Air Museum. Today again you will taste lunch in a local restaurant. The tour will end at 16:30-17:00 and then we will transfer you to hotel. We will pick you up from your hotel in Cappadocia at 08:45 am and depart from Goreme. After passing Kayseri city, we will visit the 13th century Selcuk Caravanserai "Karatayhan". Our next stop will be in Pinarbasi for a short tea break. Then we will keep driving to Tekir for Lunch. After taking pictures of the gorgeous scenery of the Tekir Valley we will drive to Adiyaman and check-in to our hotel. Dinner and overnight in Adiyaman. Today's breakfast, Lunch and Dinner is included. 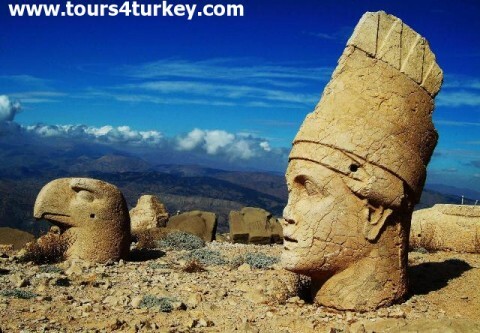 On the way to hotel we will visit the ruins of the Arsemia Roman bridge of Cendere and Tumulus Tomb of Karakus. We will keep driving to Sanliurfa and Harran. On our way, we will visit the Ataturk Dam which is the biggest dam in Middle east. We will check-in to our hotel in Sanliurfa and have our lunch there. After the lunch we will visit Abraham's Cave and the Pools of Holy Carp surrounding it. We will than walk around oriental covered bazaar and drive to Harran a village of Spellbinding Mud-Brick "beehive" houses mentioned in the book of genesis where Abraham spent the last years of his life. After visiting the ruins of Harran including city walls, oldest Islamic university and the castle dated to 18th century we will drive back to hotel. Dinner and overnight stay will be in Sanliurfa. Today breakfast, Lunch and Dinner is included. After breakfast we will transfer you to Sanliurfa airport for your flight to İstanbul. Flight form Sanliurfa to Istanbul takes about 70 minutes. On arrival we will meet you at the airport transfer you back to your hotel in Istanbul. End of the tour. Every Saturday & Tuesday Guaranteed Departure From Istanbul.